In the summer we were wowed by Simone and Ruby’s 1940s routine. With Christmas Business Come Dancing just around the corner, we caught up with the two lovely ladies to talk about their BCD winners experience and they even had some words of wisdom for this year’s participants! How did you go about starting to work on the routine? How long did you rehearse for? RUBY: We started rehearsals about four or five weeks before the final show, meeting up a couple of times every week. We spent the first hour getting to know one another and having a chat about music, costumes, etc. After that, there was only the not-so-simple task of nailing the routine! It was hard work, but we always left the rehearsal room beaming! SIMONE: Ruby and I met, had a brief discussion about dance styles and then she played me the song. Once we started rehearsing, we started changing up the choreography so there was an element of fluidity to it and made you feel like you were fully involved in the experience. We rehearsed for about 4 weeks, a couple of times a week max. What was your favourite part of participating in Business Come Dancing? RUBY: Watching Simone grow in confidence and skill every single week was one of my favourite parts of the ‘Business Coming Dancing’ experience. It’s also a privilege to do what I love at the same time as raising money for a cause that is very close to my heart. SIMONE: To dance! And to do something out of my usual day to day life – was so rewarding and so much fun! 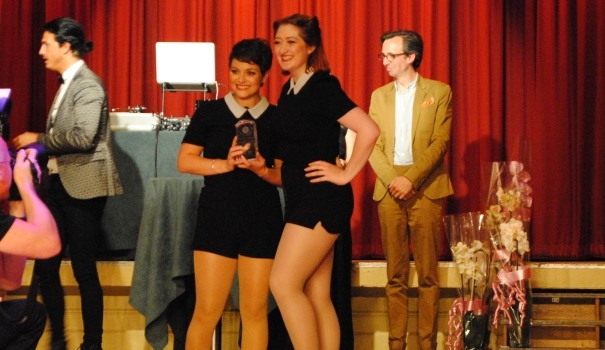 RUBY: Winning ‘Business Come Dancing’ was an absolutely exhilarating experience. I couldn’t be more proud of my partner, Simone. We were both bouncing off the walls for weeks! SIMONE: Awesome! And validating – that at 33 (then) I still had it and could keep up with the professionals (just!). It was great to do something that was just for me too – something that I wouldn’t normally have done. What advice would you give to those participating in our summer Business Come Dancing? RUBY: Love every single minute of it, because it’s over in a flash! It’s great to win (*wink wink*), but also remember to have fun! SIMONE: Embrace it – every aspect of it, including the pain (I sprained both ankles on the day of the final!) and just go for it. Christmas Business Come Dancing is taking place on 16 December – book your tickets now by calling 01202 203630!